Experience the diversity of Southern Africa -Impressive national parks, exotic animals, picturesque sandy deserts, endless dry savannas, beautiful beaches, vineyards and African joie de vivre. Explore the famous Garden Route in South Africa at your very own pace in your camper van. Embark on your own game drive and watch the "Big Five" with our 4WD campers in the Kruger National Park in South Africa or in the Etosha National Park in Namibia. And don’t forget the Limpopo National Park in Mozambique which is a truly unique experience. Let yourself be enchanted by the scenery and wildlife! There are numerous other natural attractions such as the scenic Sossusvlei Dunes in Namibia or the Victoria Falls in Zimbabwe and Zambia. A special highlight is a ride on the Mokoro through the Okavango Delta in Botswana. 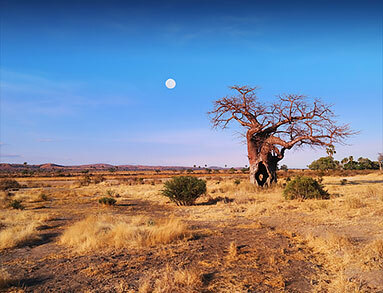 You want to explore Southern Africa at your own pace? Our rental stations are located in Cape Town, Johannesburg, Durban, Port Elizabeth and Windhoek, which are excellent starting points for a round trip with a camper van. All vehicles such as campers, off-road 4WD campers and 4WD vehicles at Motorhome Bookers come from suppliers with a very good reputation. Our rental partners include Britz, Maui and Bobo Campers. Britz is our specialist for all-wheel drive camper vans which are perfect to explore the wonderful national parks. Maui specializes in comfortable and spacious RVs for 2 to 6 people. Bobo Campers is one of the most popular African rental companies and is a well-run family business since 1991.